On March 11, 2011, a 9.0 earthquake off Japan’s northeast coast triggered a tsunami that killed more than 20,000 people, displaced 600,000, and caused billions of dollars in damage as well as a nuclear meltdown of three reactors at the Fukushima Daiichi nuclear plant. Japan, the world’s third largest economy, was already grappling with recovery from both its own economic recession of the 1990s and the global recession following the US-driven financial crisis of 2008 when the disaster hit, changing its fortunes yet again. This small, populous Asian nation—once thought to be a contender for the role of the world’s number one power—now faces a world of uncertainty. Japan’s economy has shrunk, China has challenged its borders, and it faces perilous demographic adjustments from decreased fertility and an aging populace, with the country’s population expected to drop to less than 100 million by 2048. In July 2012, the SSRC convened seventeen social scientists, including eight Abe fellows and a member of the Abe Fellowship Program committee, in Tokyo, Japan, to discuss prepared papers representing a multidisciplinary look into Japan’s future. 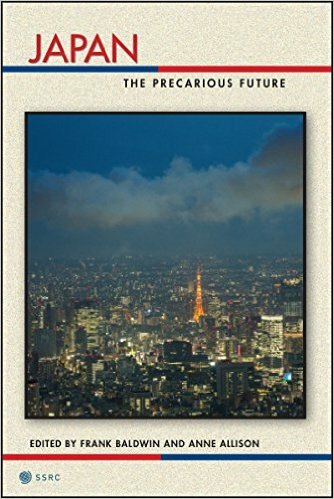 In the resulting volume, Japan: The Precarious Future, these distinguished scholars of Japanese economics, politics, law, and society examine the various roads that might lie ahead. Will Japan face a continued erosion of global economic and political power, particularly as China’s outlook improves exponentially? Or will it find a way to protect its status as an important player in global affairs? Contributors explore issues such as national security, political leadership, manufacturing prowess, diplomacy, population decline, and gender equality in politics and the workforce, all in an effort to chart the possible futures for Japan. Both a roadmap for change and a look at how Japan arrived at its present situation, this collection of thought-provoking analyses will be essential for understanding the current landscape and future prospects of this world power. This project commemorates the twentieth anniversary of the Abe Fellowship Program, a collaboration between the Japan Foundation Center for Global Partnership (CGP) and the SSRC. The fifth volume of the SSRC’s Possible Futures series. Japan: The Precarious Future, eds. Frank Baldwin and Anne Allison (New York University Press/Social Science Research Council, August 2015), http://www.pacificaffairs.ubc.ca/current-issue-2/current-book-reviews/#japanheinrich.